For May 7 update, click here. Many of you may recall Chaz Leroy, (the gals called him Chaz and the guys at Florida Power & Light [FP&L] yard called him Leroy) but the latter name won us over. 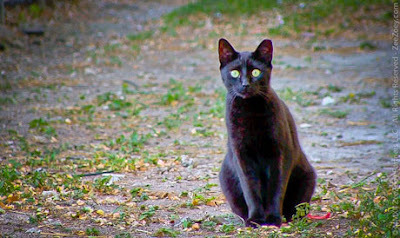 Leroy is one of the black Riverfront cats that is friendly, docile, affectionate and spotlighted in our various posts about caring for community cats. From educational videos to National Feral Cat Day, Leroy is a favorite of the caretakers at Riverfront Cats. Sadly Leroy went missing for three days--a red flag that something bad happened. Was he injured and fighting for his life? Recuperating in places we never see? Or was he.... dead? You see Leroy never missed a feeding. He showed up like clockwork at 7am to greet the FPL guys at the gate for breakfast, in the yard at 3pm for afternoon snack, and in the evening over by our condos for dinner. Cats are smart. Their internal clocks are more reliable than a Swiss clock. With each passing day volunteers walked the neighborhood, calling his name, treats and tuna in hand. No sign of Leroy. Our hearts sank a notch every time. The last day he was seen was a Wednesday. Then he appeared on Sunday. Laying in the high grass, away from the cat house, Leroy was lounging on a lazy Sunday. But this was no post picnic weekend wind down. In the dim light, we discovered his hind left leg was grossly swollen and missing fur, but no trace of blood. Did he lick it away? A volunteer came rushing with a pet carrier and towel and we scooped him up, no struggle, no hissing. Leroy was play-dough in our arms as we contorted his body and gently placed him in the carrier. 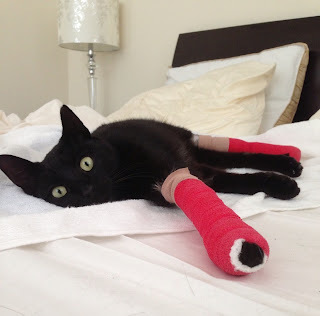 The vet explained there were no bite wounds or fracture. It appeared to be a chemical burn. His fever was running high and there was a 50/50 chance of saving the leg. Our options: try an aggressive treatment to save the leg, or go straight for amputation. Thankfully he wasn't feral and we gambled he would remain tame indoors (as can happen when you place an outdoor cat and try to convert him to an indoor cat). 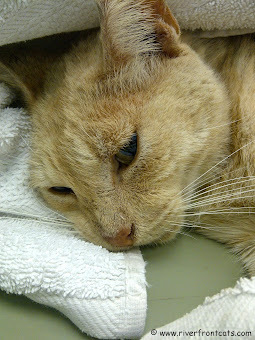 If administering medications was not a struggle, Leroy would remain indoors regardless of the final outcome. So why didn't we bring him in earlier? Good question. For many reasons.Click here to learn why. We opted for aggressive treatment. The vet cleaned the leg and then noticed a similar burn on his front left paw. Volunteers felt faint. Double amputation? The word "amputation" is like a loaded gun for the untrained. Like doctors and soldiers, witnessing and treating horrific injuries is common occurrence, it's part of the job for animal rescuers. Prior experience prepares us. But a possible "double amputation" left us speechless. Leroy would remain hospitalized for three days and two nights, hooked up to an IV, and given fluids, antibiotics and pain medications. 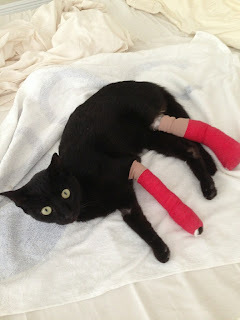 On the third day we picked him up, both left legs mummified in bandages they looked like clubs next to his healthy svelte legs. Leroy resting at home in carrier with bandages on both left legs. RC Volunteers continue administering antibiotics, antacid, a laxative and pain medications and return every two days to change the bandages. At this point we are praying to save Leroy's legs. We can't do it alone and need your help. The vet bill is approximately $600*. It adds up fast. If you can help with a financial donation, we welcome any amount. Simply click here or the Give Now button on top right.We are only asking for help if you can give. Not every one is able to donate and we completely understand. 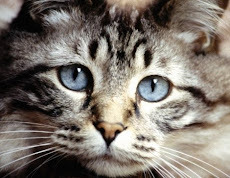 However, if you have to do online shopping for your household or buy pet food, supplies and medications, please consider shopping at your favorite retailers (Walmart, Petsmart, Amazon, eBay, Old Navy.... ) by first visiting this page, clicking our links, and begin shopping so that Riverfront Cats receives a small proceed! It's a win-win-win for all! REMINDER: Mother's Day is coming up! Buy your gift online and help homeless pets at the same time. Bad news / good news. The fever returned and the left hind leg has not improved. The specialist determined the leg must be amputated. 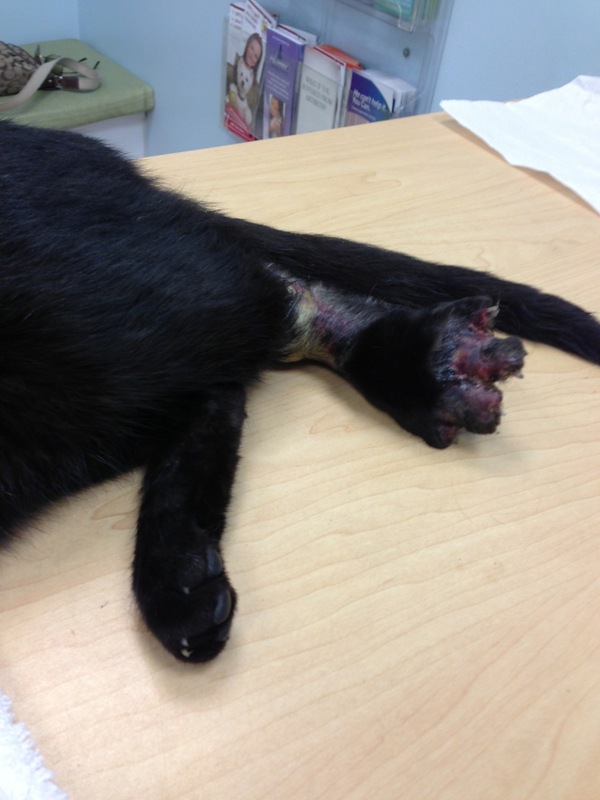 The good news is that the swelling reduced in the front left leg and the leg is salvageable. The estimate for the amputation is $1,800 at Miami Veterinary Specialist. More importantly, Leroy is in good spirits and adjusting well to indoor life. He has not hissed or shied away from other resident cats. 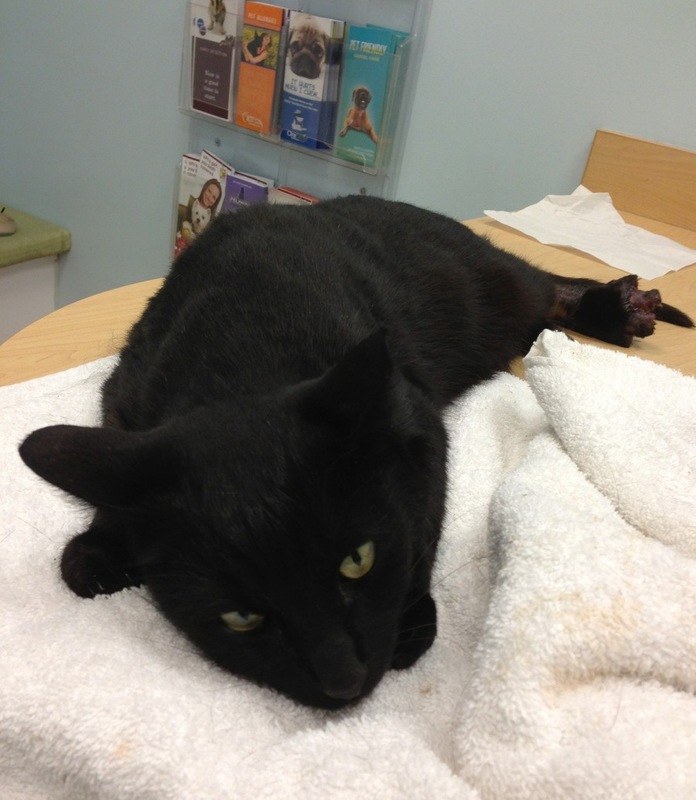 We will provide lots of TLC for his recuperation and we know we can find him a permanent loving home. Tripods (3 legged) animals are easier to find homes for than healthy adult cats. Bless you for caring. Together we can make a difference! * Leroy's vet bill is addressed to Sabrina Vega. 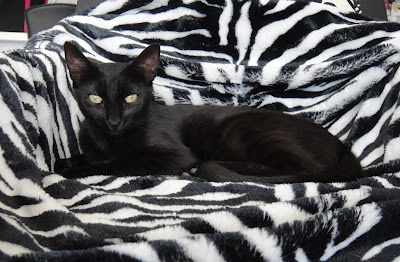 Sabrina is the Vice President of Pawsitively Humane Inc. aka Riverfront Cats. No board members receive any compensation. The subject of community cats (also known as colony cats or neighborhood cats) is still largely unknown. While the cat may be the number one pet in the U.S., the average resident has low awareness of the plight of homeless cats, the causes, the challenges and even the solutions. One of the questions we often receive is "Well if you brought in one friendly outdoor cat, why not bring them all indoors and find them permanent homes?". Good question. The best way to answer is to illustrate with a real life example. First, there are 20 neighborhood cats here at the Riverfront. "Bringing them in" is no walk in the park. It requires time, patience and routine to socialize them and get them accustomed to living indoors. 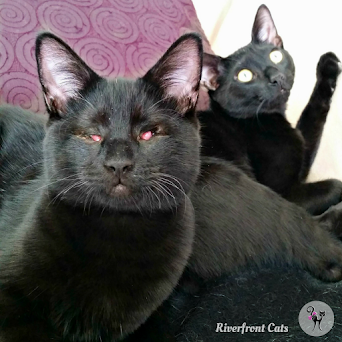 Another scenario is about a family of four black cats--Nikki (mother) and her offspring, Sonny, Leroy and Tiffany. 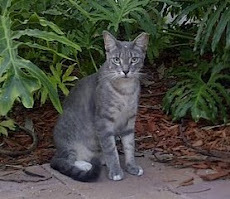 These were Riverfront Cats that live and roam on both the Florida Power & Light (FPL) yard and the neighboring Riverfront condos. 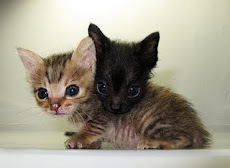 All four cats were managed (cared for and fed) by two kind men at FPL and RC volunteers. The black cats were all friendly, and welcomed petting and regular feedings. Sadly, on a cold winter night a couple of years ago, the mother Nikki, was found dead in the transformer room at the FPL yard. She was electrocuted. This is an installation where small mammals can crawl in including opossums and racoons. They find warmth on the electric coils. A month later, Sonny, was found dead inside the substation. As a knee jerk reaction, I brought in Tiffany. She was the smallest and quite affectionate. But upon bringing her in, Tiffany had difficulty adjusting. She no longer exhibited that carefree spirit and one could detect her longing to be outdoors whenever she heard the sounds when I opened the balcony door. A strange environment, other alien cats, and walls all around...this is daunting for a cat that has lived outdoors. Simply put, cats do not like change. Tiffany eating outdoors--she is pictured in our graphic image on home page. Transition takes time and developing new routines is important. 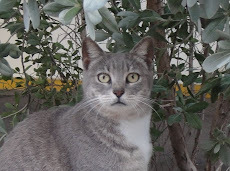 While Tiffany learned our household routine and was assured she would have shelter free from ants, mosquitoes, extreme heat, humidity and occasional cold front, and provided clean litter and regular meals, there was a trace of sadness in her eyes. I had stripped her of her freedom to run, climb and explore and detached her from the only family she knew--her brother Sonny and friend Lion King and the other feeders/caregivers. "Did I do the right thing?" I asked a longtime cat rescuer and caretaker. "Sometimes it's best to leave them outdoors. It's their home. 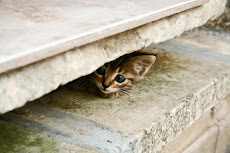 The cats know the area and they always have food and know where to seek shelter from storms.". With that, I decided to leave Leroy outdoors with an expensive all wood cat house. At the same time, I was determined to uplift Tiffany. She clearly had energy and needed more space beyond the confines of a two bedroom condo. I went on a mission to find her a permanent large home. And I did. She is happily living in a two- story home in Baltimore, MD with a loving couple, stairs to climb, a large window with a view to the outdoors and a playmate that has wholeheartedly accepted her and they play constantly. It is the perfect ending to that chapter. At the time of this posting, Leroy was discovered with a horrific hind leg injury. The vet surmises a type of chemical burn. Yet there are no chemicals in the visible areas where he roams. The bill to date is $700. If amputation is needed, that's another $1800. In this case, the vet care is astronomical. City streets are no place for a cat. The dangers exist. Perhaps taking in friendly cats, one by one, socializing them, finding them homes will now become our new protocol. Fanny is a sweet outdoor cat. Never feel guilty about the decision you made. You do the best you can knowing you did everything in your power. We are here to listen to your case and offer insight and suggestions to help make a difference. The goal is for the cats not to suffer. There is always a solution. Here's a fun cat facts video! Short, sweet and funny. 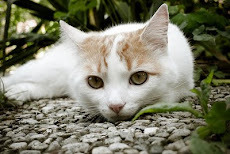 It's helpful to know why our cats behave they way they do, how to tell a female from a male, and the reason behind that sweet purr we love so much. Enjoy! 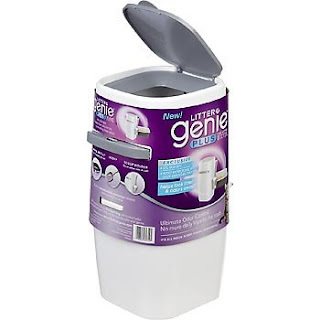 Update April 9: The winner of the Litter Genie is KIMBERLY EHRHARDT! Congratulations Kimberly! Please check your email and reply within 48 hours to claim your prize. When the New Year rings in, we look forward to those unexpected highlights in life. One of those extended fireworks sparkled last Thursday. It was the date that I met one of my favorite authors, Gwen Cooper. 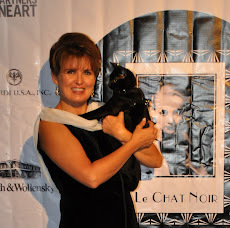 A native Miamian, Gwen is the author of NY Times bestseller, Homer's Odyssey, the story of a blind black cat she adopted as a kitten. 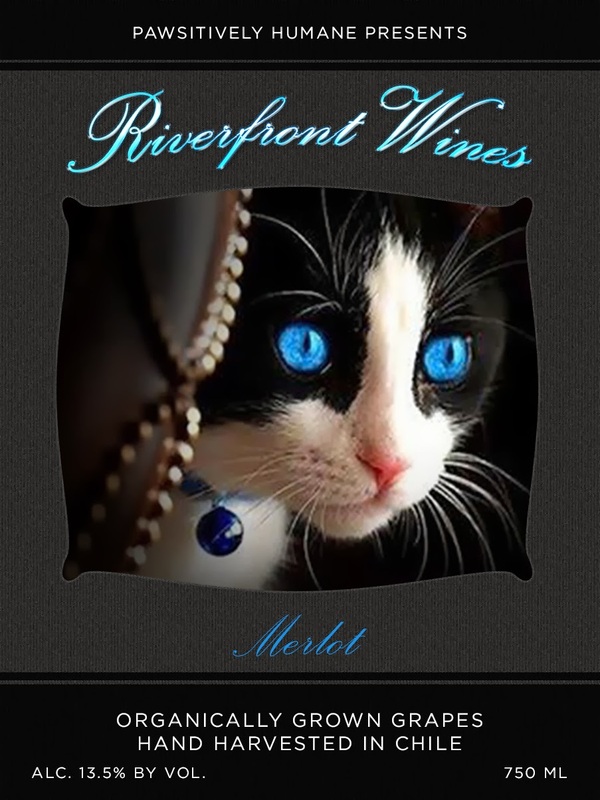 I loved the book so much that I shared a review on both my personal blog and for Riverfront Cats. Gwen is an author and a cat lover, the best combination of qualities in my opinion. 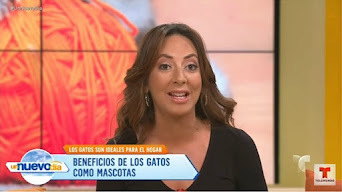 Her book not only entertained readers but it really helped to educate new and non cat owners about cats in general, that blind cats are not entirely handicapped, and that in having three cats a woman can lead a robust life, thus demystifying the label of "crazy cat lady". So when I learned that Gwen was returning to Miami to launch her new book Love Saves the Day, I cleared the calendar and counted the days. At Books & Books in Coral Gables, Deb Barnes and I along with fellow Cat Network members, caught up with Gwen before the other fans arrived. She was everything we imagined and more. While some authors are introverted and develop sweaty palms and jitters before speaking engagements, not Gwen. Or at least she didn't let you see her sweat. She was chatty and perky and we felt like instant friends. This evening she read from the first chapter of her new book, Love Saves the Day. For a video introduction to her new novel, please visit my previous post. We learned that the book was a two year project but rewritten entirely three weeks before the deadline. The pressures of authoring a book! So why fictional? For starters, the setting is the Lower East Side of Manhattan. Gwen was drawn by the eccentric trappings of this corner of Manhattan beholden to the art and music of the 70s and 80s. There are numerous references to Gwen's husband, a music lover. Sarah (the mother in the book) is a former aspiring DJ. 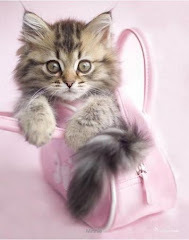 And the name of the cat "Prudence" came from? You guessed it! Dear Prudence, a Beatles song Gwen's husband played incessantly during the writing of the book. "It was fortuitous that the refrain sang 'Dear Prudence won't you come out to play', " shares Gwen. We love learning these nuggets of information that shape the story for a book. As she read from the book, I was spellbound. The first third of the book is written from the point of the view of Prudence the cat. Gwen portrayed the tone, the attitude of Prudence with red laser dot precision. Gwen knows Cat! Prudence plays an important role in harmonizing a young woman's conflict with her past-- a tumultuous upbringing in her mother's dusty, Bohemian record store. Later chapters change to the third person and we learn more about the characters and devastating details about housing in the Lower East Side. 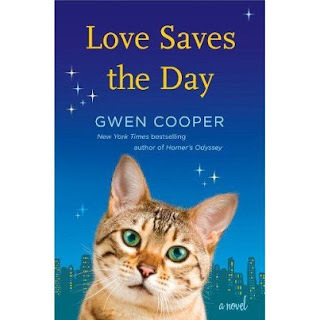 After the reading Gwen did advise not to be mislead by the juvenile book cover--the gradient blue background, sparkling stars and young looking brown tabby cat. Everyone can relate to the moral of the story- the complexity of relationships especially when a parent dies--circumstances beyond anyone's control that leads to a strained relationship, about the things left unsaid, and miscommunications. Pets we know can be the catalyst in bonding people. The journey and lessons of life are drawn from both humans and animals. There’s an extra bonus for music lovers of the 1960’s -1990’s especially those that remember the New York music scene in late 1970’s, disco and punk. Gwen graciously includes an acknowledgement section listing some of the books that served as valuable research material, such as books about music, the Lower East Side, and Alphabet City. We highly recommend the book and with warmer weather approaching, it's a great summer read on the hammock, under a tree or in your favorite reading room. Gwen's visit was thanks in part to the makers of the Litter Genie. I was fortunate to win one but knew readers could use it more. Therefore we are giving away one white Litter Genie to a lucky reader anywhere in US or Canada. Contest closes at 11:59pm April 7. 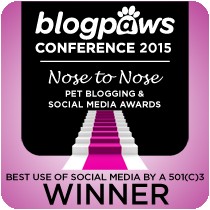 The winner will be announced here on this post after April 7. Winner has 48 hours to claim prize. Share this giveaway on Facebook. Leave a separate comment here letting us know you posted FB. Share this giveaway on Twitter and leave a separate comment here letting us know you tweeted. If you would like to order Love Saves the Day, or the Litter Genie for your home, click on the links below to place your order with Amazon. 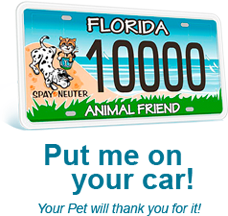 By using these links, Riverfront Cats benefits with a small proceed for our fundraising efforts to pay vet bills. Good luck! And let Love Save Your Day.